Saw this photo taken by Diane Arbus in ~1968 at the Whitney a month and a half ago and did a triple take. It has Mad Men / Matthew Weiner inspiration written all over it: squint a little, and you can see Betty, Bobby, and Don, surrounded by litter, cigarettes, and disdain. Nelson Mandela, the revered statesman who emerged from prison after 27 years to lead South Africa out of decades of apartheid, passed away on December 5, 2013. Few men in the history of mankind have had more impact on a nation and inspired the world like the former president. 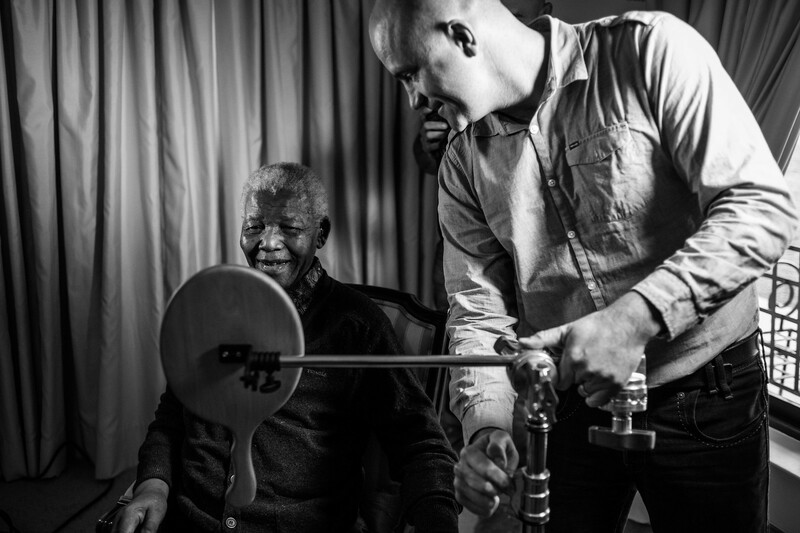 Shortly before he retreated from public life in 2011, Mandela participated in photographer Adrian Steirn’s 21 Icons project — a photographic and short-film series profiling the men and women who shaped modern South Africa. These are incredible. See the full set, check out 21 Icons South Africa , see another set by Steirn with Mandela, and read more at flickr. And don’t miss this one. NASA and JPL continue to release some incredible images. Click the image to see a large version in a new window; click here to see huge ones over at NASA. On July 19, 2013, in an event celebrated the world over, NASA’s Cassini spacecraft slipped into Saturn’s shadow and turned to image the planet, seven of its moons, its inner rings — and, in the background, our home planet, Earth. With the sun’s powerful and potentially damaging rays eclipsed by Saturn itself, Cassini’s onboard cameras were able to take advantage of this unique viewing geometry. They acquired a panoramic mosaic of the Saturn system that allows scientists to see details in the rings and throughout the system as they are backlit by the sun. This mosaic is special as it marks the third time our home planet was imaged from the outer solar system; the second time it was imaged by Cassini from Saturn’s orbit; and the first time ever that inhabitants of Earth were made aware in advance that their photo would be taken from such a great distance. With both Cassini’s wide-angle and narrow-angle cameras aimed at Saturn, Cassini was able to capture 323 images in just over four hours. This final mosaic uses 141 of those wide-angle images. Images taken using the red, green and blue spectral filters of the wide-angle camera were combined and mosaicked together to create this natural-color view. A brightened version with contrast and color enhanced (Figure 1), a version with just the planets annotated (Figure 2), and an annotated version (Figure 3) are shown above. This is hilarious. Learn more at colossal or check out Carli Davidson’s website for photo samples and more about the project. HiRISE returns images of the Martian surface with higher resolution than ever seen before from an orbiter. This means we can see extraordinary detail in all kinds of surface features. Scientists all over the world are already using these images to understand many previously-unexplained phenomena on the Red Planet. We might also discover brand new types of features never seen before! The stereo and color capabilities will also allow us to explore Mars in 3D, and with compositional information. The ultra high resolution also makes HiRISE the perfect tool for investigating the safety of future landing sites for other missions, such as the Phoenix lander or the Mars Science Laboratory. We’ve also done some searching for past Mars landers, both successful and not. But even without the higher resolution and added capabilities, additional cameras in Mars orbit are always valuable for imaging new terrains on Mars, and for monitoring the dynamic surface and atmosphere for activity and changes. I took off to Basel a couple weeks ago for a large environmental health conference. Before leaving, I rented a Sony DSC-RX1 from borrowlenses.com and picked it up at RayKo in San Francisco. Switching from my normal photography kit — a 5D Mark II, a 17-40 f/4 L, and a 50mm L — to this wee little gadget felt like an impossible stretch. I’ve shot almost exclusively on Canon gear since I borrowed my family’s old Canon T90 in the late 80s. I was a little scared of something new (we fear change) and concerned about how long it would take me to figure out the Sony. The RX1 turned out to be a delight — the camera produced pictures on par with the Mark II and the fixed focal length forced me to stop and think before shooting. A good exercise for any photographer. Somewhat organized thoughts and notes on the camera follow. At first glance, the RX1 is underwhelming — it resembles a standard point + shoot. It looks pedestrian. All that goes away, though, once in hand. It’s weighty and substantial, dense and solid. The glass — a spectacular Zeiss 35mm prime f/2.0 — has a satisfying, clicky (and wholly electronic) ring for selecting an aperture. The RX1 borrows styling cues from old school rangefinders (Leicas, the Contax G series). It’s got a full-frame 24 megapixel sensor and shoots 14-bit raw images. The screen is bright — really, really bright — and displays images vividly and accurately in broad daylight (no small feat). The overlays on the screen are nice and completely controllable; you can quickly turn on and off a batrillion status indicators. A nice touch: the ability to enable an on-screen level, helping compose the shot and avoiding rotating/cropping during post-processing. The RX1 - with this combination of fancy and traditional - is an odd gadget, full of ultra-modern, high-end technology, but formed wholly by older platonic ideals of what a camera should be. The wonderful lens, the beautiful controls, and the insane, huge, magnificent sensor all come with some caveats. The RX-1 has no optical or electronic viewfinder. I spent the better part of my time with the camera lifting it to my face, looking for something to look through — and then remembering that my viewfinder was the screen on the back (now complete with cheek imprints). For me, that was the single most difficult thing to become accustomed to. The cost to play is high — 2800 USD. The fixed lens confused colleagues who handled the camera; once they played with it for a few minutes they wondered about other lens options. Their reaction — that at its cost, a fixed lens seemed inappropriate — wasn’t surprising. The image quality is astounding. The RX1 performs much like other full-frame cameras — it does a great job up to ISO 3200, and fine beyond that. I shot regularly across the gamut — from 100 to 3200 — and am pleased with all of the results. The focus times weren’t nearly as fast as the Mark II, but weren’t slow enough to be a real concern, except when it was between dim and dark where I was shooting. While the focusing often failed under those conditions, the image quality held up. Battery life wasn’t great — the camera made it through most days of shooting with little power left. This was okay in Basel, where most of my days were spent in a conference center and away from camera-worthy moments. If I had been outdoors more and working less, I’m confident I would have exhausted the batteries regularly. On the upside, the camera can be charged with any portable USB battery; the downside, of course, is the added bulk. Were I to rent the RX1 again, I’d get one or two extra batteries (and an external viewfinder). Downsides… The menus run deep and require some serious thought to decipher. They’re better than on many cameras, but that’s not saying much. Another nice touch: most of the physical buttons on the camera can be reassigned to custom functions. This helped me get comfortable with the camera much more quickly, putting commonly used controls in easy reach. I could go on and on about this camera. But others have done that, and far more eloquently and capably than I. This, in my opinion, is the camera to beat. It redefines what a small and light camera can be, and does so without compromising image quality. It’s not perfect, but if I could afford one, it would be my go to daily camera. there is so much amiss in this photograph. I don’t know if this is a curated collection or just a fan finding every behind the scenes image he can from ESB… but it doesn’t matter. The pictures are amazing. Enjoy. Pretty amazing time-lapse photography from Babak Tafreshi, a science journalist, photographer, and astronomy communicator. Captured on March 20 in northern Norway. In the past few weeks, a lot of people have been mining the LoC photo databases for images of public works posters, images of cities early in their development, etc. The archive is outstanding and a lot of the pictures, negatives, schematics, and drawings are available online in multiple resolutions. I ran some searches for household energy, hearths, cooking fire, cooking stoves, etc and found a number of fascinating results. Many of the pictures from the US were not available online yet - in particular, two libraries of “cooking technologies” from the 1920s and 1930s weren’t around. I’m working on getting access to those through some data request channels. A few that were accessible are below. The majority are from Sikkim and were taken by Alice Kandell between 1965 and 1971. The large one above is supposedly from Jerusalem and was taken between 1900-1920. The seventh one below is from 1908 in Paterna, Spain. Clearly a wealth of interesting historical information in the archives. Looking forward to further explorations. Normann Szkop, a French photographer, took some amazing photographs of Tulips in the Netherlands. See them all at this Flickr page. Flying over the Tulips Fields in Anna Paulowna a municipality and a town in the Netherlands, in the province of North Holland. The tulip has come to be a loved symbol of the Netherlands. Many tourists visit the country just to see the bright coloured flower and the astonishing view over the bulb fields. The season begins in March with crocuses, followed by the daffodil and the yellow narcissi. In April the hyacinths and tulips blosssom to some time in mid May, depending on the weather. Later, in August it is time for the gladioli. Even when spring is over, the Netherlands is still a garden, visitors can enjoy flowers in the Netherlands all year round. In the 20th century, the bulb flower business continued to boom, resulting in the establishment of auction and trading houses, large-scale cultivators and cooperatives. Today, The Netherlands exports bulbflowers in large quantities to over a hundred countries worldwide. One set of photographs - his “Imported Landscape” series — is particularly striking. It examines the impact of the Karahnjukar Hydroelectric Project in eastern Iceland. The project consists of three dams, one of them being the highest in Europe, and a hydroelectric power plant. The dams block among others the big glacial river Jokula a Dal, creating the 57km2 artificial lake Halslon. The power plant is primarily being constructed to supply electricity to a new Aluminum smelter built by Alcoa of USA in the fjord of Reyoarfjorour on the east coast of Iceland. The artificial lake and the constructions have spoiled the biggest wild nature in Europe. Making the Karahnjukar project, not only the biggest project in Icelandic history, but also the most controversial one. There have been a lot of debates about this project. Environmentalists are fighting for the preservation of the wild nature while those supporting the project talk about the need to use the energy the nature has to offer. The best way for me to participate in the debate was to follow the land in its transformation. Environmental degradation in the name of energy production — even ‘clean’ energy production — is nothing new. Thomsen’s take starkly frames the respective powers of man and nature as antagonists. For me, he conveys perfectly our conflicting senses of nostalgia/loss and awe/control. His photos embody contrasting, awkward meanings of power — electricity, energy, dominion, destruction, beauty. The concept is simple: shoot the individual planes flying across a pure blue sky, then chroma key the blue out as if it’s a green or blue screen leaving only the plane behind. Then put them all together on a video timeline. I did some tests and discovered that it didn’t work well if there were trees in the edges of the frame so scouting good locations took the most time. I watched the weather for a cloudless day then sat in a park and shot every plane that flew over. I locked the camera (Canon 7D with a EF-S 17-55 f/2.8) on a tripod and shot the planes with 1080p video at 24fps with an exposure I’d tested the day before (50/s, f/13, ISO 100) that would keep the sky deep blue with no blowout for a good chroma key. To give the video a sense of temporal change as the planes fly by I did an 8 hour time-lapse under a bridge nearby shot at the same angle and composited it over the planes. Without it there’s no sense of time passing. I used an intervalometer to shoot about 800 images with the same exposure as the video. Once I had it posted as a regular video clip, I keyed the sky out of it as well. I put everything together in Adobe Premiere, which challenged my system since I needed 40 video tracks to stack all the airplane clips together. The last piece was to put a new sky back in — a still image with depth and clouds that’s panned using key frames in Premiere. In an effort to provide concrete visual proof of climate change and its devastating effects, photographer James Balog embarked on a years-long project that spanned the northern reaches of the globe. He set up cameras from Greenland to Alaska in order to capture horrifying—yet undeniably beautiful—time-lapse photos that reveal the unprecedented rate at which glaciers are receding. As the award-winning Chasing Ice, which chronicles Balog’s monumental endeavor with his Extreme Ice Survey, hits New York on November 9, VF.com showcases breathtaking photographs from Balog’s Ice: Portraits of Vanishing Glaciers, published by Rizzoli. The announcement of the Veolia Wildlife Photographers of the Year has been floating around the internet for a few days. I’ve been wanting to link to it, but have been having a hard time finding high resolution images on their website. Thankfully, the Atlantic took care of that. Click here to see more. Never seen anything like this before. Really cool stuff. Via Colossal. See more of his long-exposure photographs here. 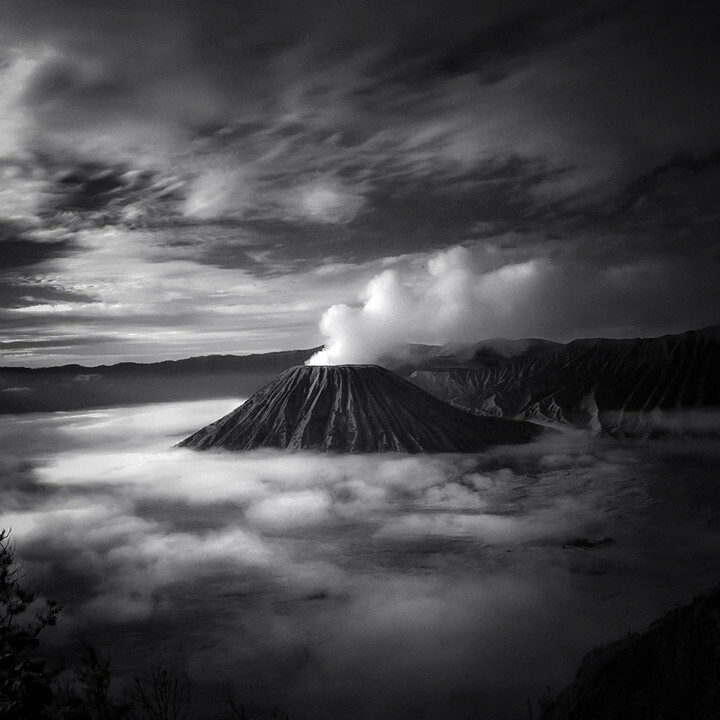 Hengki Koentjoro was born in March 24, 1963 in Semarang, central java, Indonesia. He acquired his knowledge of multimedia production at brooks institute of photography, Santa Barbara, California, USA. Majoring in video production with minoring in fine art of photography, he graduated in 1991. Photography is not just a way of expressing his most inner soul but also creating a window to the world where through his pictures the unseen and the unspoken can be grasped. Driven by the desire to explore the mystical beauty of nature, he develops his sense and sensibility through the elements of fine art photography. His freedom of expression is more reflected in the elaboration and exploration of black and white. Photography can never be separated from the aspects of making the common things unusual, welcoming the unexpected, indulging and embracing ourselves with the joy of photography as well as believing that anything is possible. Zhang Kechun is a 32 year old Chinese photographer born in Sichuan, China. He’s created a large-format collection of photographs called “The Yellow River Surging Northward Rumblingly.” The images — with their muted tones — showcase a stunning, vast landscape mottled with people. The large intrusions and scars on the scenery — smoke stacks, superhighways, cooling towers — appear unnatural, huge, imposing. Large compared to the scale of the people in his photos, but small in comparison to the enormity of the surroundings. Really impressive work. It is a river, with its unity of bend and straight, fullness and imperfection, rapid and slow, active or tranquil, majestic and elegant, simple and wonderful, bright and dark, light and color, form and spirit, visionary and real… It embraces people’s reality and fate, joy and sorrow, firmness and leisure. I determined to follow its pace, with all my courage and my… large format camera. See the whole set here. These are stunning, multiple exposure shots created on a modern Nikon camera by Christoffer Relander. See more. A few weeks ago, The Morning News featured photographs from James Nizam of Vancouver. They referred to an article in Canadian Art that described Nizam’s process in more detail. The large black and white photographs depict the transformation of darkened rooms into uncanny light sculptures that intersect elegant geometry with math-class daydreaming. Bridling sunlight into streamlined rays via perforated and sliced walls, and with the aid of artificial fog to intensify the slants of light, Nizam creates imagery that might bend our perception of photography. The majority of works in the exhibition were created in a darkened studio space where small mirrors were fastened to ball joints for easy pivoting, perfect for manipulating the light streaming through holes in the walls. The logistics were no small feat; Nizam sometimes had as little as five minutes of perfect sunlight in which to create his images. And the process of waiting for those brief periods no doubt felt like déjà vu for a photographer who has spent plenty of time in dim rooms watching dust dancing in sunlight. The effect is striking. Highly recommend checking out more of his work at Nizam’s website and at TMN. More on the specific process used to create these images is available here. What Lies Beneath the New York Times? Fascinating short piece by Claire O’Neill about the man responsible for the NYT Archives — and the archives themselves. I got a little kick out of Claire taking a photo, with Instagram, of a picture of William Faulkner taken by Henri Cartier-Bresson. Worlds colliding, a bit — a quick snapshot of an old print filed away underground in an antiquated fashion. (Also, Faulkner slays, even in a photo of a photo. Slays). By the numbers: It’s 4,000 cabinet drawers of newspaper clips, according to Roth, and 5 to 6 million photographic prints and contact sheets, cross-referenced by card catalogs made on typewriters and amended by hand. The scope is downright unfathomable, the system impossibly antiquated. Some of the photos from the archive are now being resurrected and uploaded to a fantastic Tumblr run by NYT called The Lively Morgue.